The green luna moth is a beautiful insect in its own right. Now picture those green wings on a dusty rose gerber daisy! If you’ve ever seen a real luna moth, you know how intriguing they are. 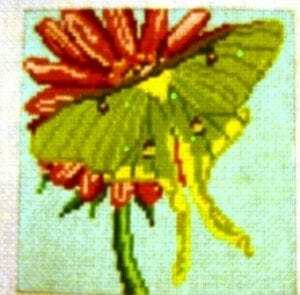 This would be great to stitch with some of the newer metallic green threads for the moth wings. You can even use sheer threads so that the paint will show through. Ask us to send threads!